When working on a project with multiple developers, it can be frustrating when one person pushes to a repository and then another begins making changes on an outdated version of the code. Mistakes like these cost time, which makes it worthwhile to set up a script to keep your repositories in sync. You can also apply this method in a production environment to push hotfixes and other changes quickly. 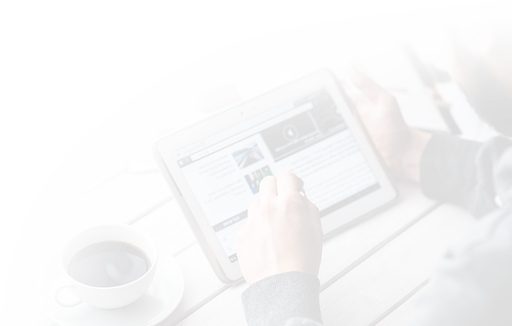 While other solutions exist to complete this specific task, writing your own script is a flexible option that leaves room for customization in the future. GitHub lets you configure webhooks for your repositories, which are events that send HTTP requests when events happen. For example, you can use a webhook to notify you when someone creates a pull request or pushes new code. 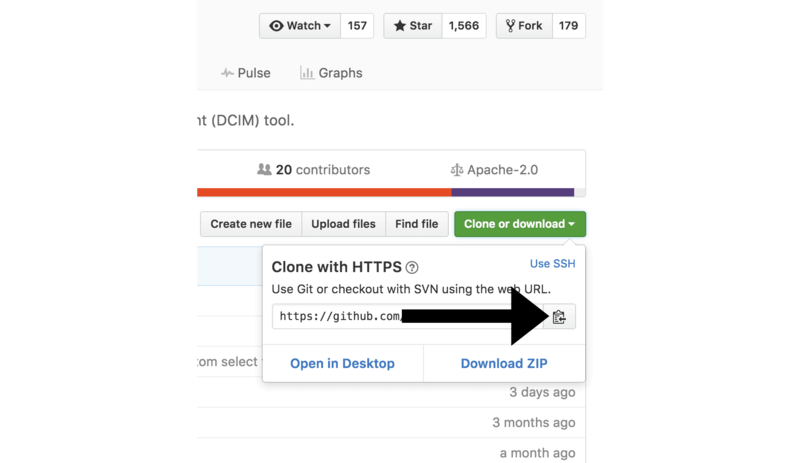 In this guide you will develop a Node.js server that listens for a GitHub webhook notification whenever you or someone else pushes code to GitHub. This script will automatically update a repository on a remote server with the most recent version of the code, eliminating the need to log in to a server to pull new commits. One Ubuntu 16.04 server set up by following the Ubuntu 16.04 initial server setup guide, including a non-root user with sudo privileges and a firewall. Git installed on your local machine. You can follow the tutorial Contributing to Open Source: Getting Started with Git to install and set up Git on your computer. Node.js and npm installed on the remote server using the official PPA, as explained explained in How To Install Node.js on Ubuntu 16.04. Installing the distro-stable version is sufficient as it provides us with the recommended version without any additional configuration. A repository on Github that contains your project code. If you don’t have a project in mind, feel free to fork this example which we’ll use in the rest of the tutorial. We’ll start by configuring a webhook for your repository. This step is important because without it, Github doesn’t know what events to send when things happen, or where to send them. We’ll create the webhook first, and then create the server that will respond to its requests. In the Payload URL field, enter http://your_server_ip:8080. This is the address and port of the Node.js server we’ll write soon. Change the Content type to application/json. The script we will write will expect JSON data and won’t be able to understand other data types. For Secret, enter a secret password for this webhook. You’ll use this secret in your Node.js server to validate requests and make sure they came from GitHub. For Which events would you like to trigger this webhook, select just the push event. We only need the push event since that is when code is updated and needs to be synced to our server. Review the fields and click Add webhook to create it. The ping will fail at first, but rest assured your webhook is now configured. Now let’s get the repository cloned to the server. Ensure you're in your home directory. Then use Git to clone your repository. Be sure to replace sammy with your GitHub username and hello_hapi with the name of your Github project. This will create a new directory containing your project. You'll use this directory in the next step. 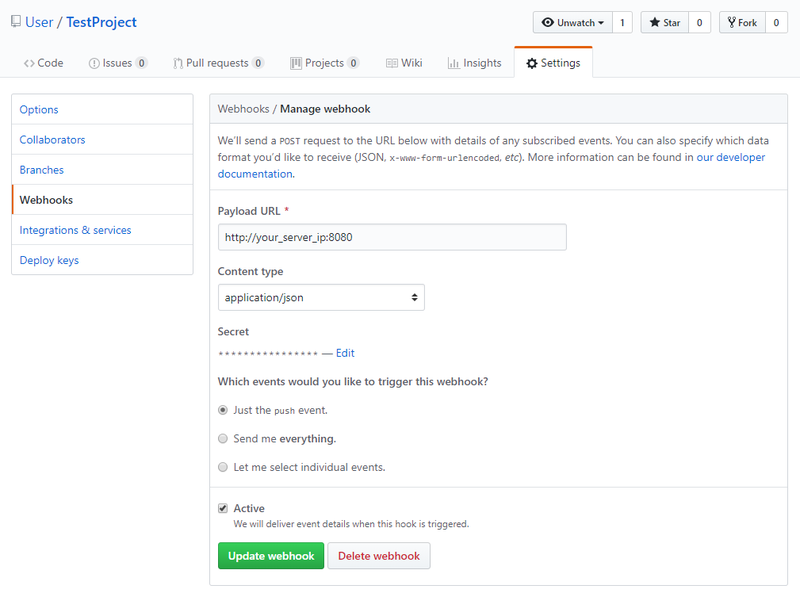 With your project cloned, you can create the webhook script. 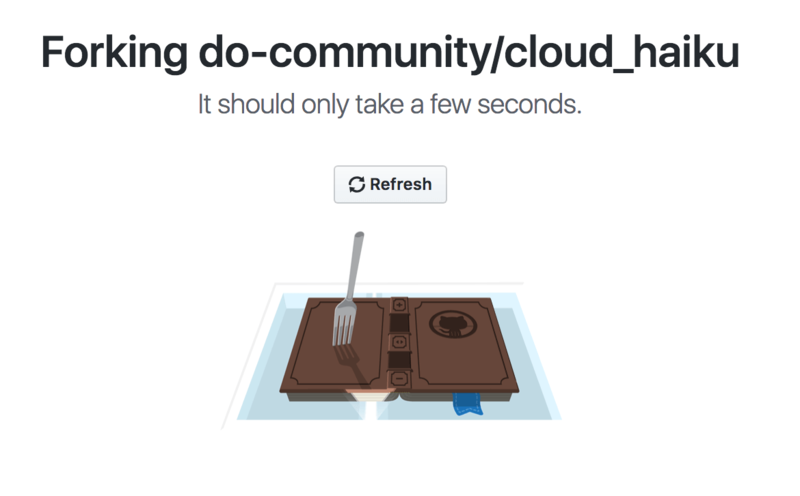 Let's create our server to listen for those webhook requests from GitHub. We'll write a Node.js script that launches a web server on port 8080. The server will listen for requests from the webhook, verify the secret we specified, and pull the latest version of the code from GitHub. Create a new file called webhook.js inside of the NodeWebhooks directory. The first line defines a variable to hold the secret you created in Step 1 which verifies that requests come from GitHub. The second line defines a variable that holds the full path to the repository you want to update on your local disk. This should point to the repository you checked out in Step 2. The http.createServer() function starts a web server on port 8080 which listens for incoming requests from Github. For security purposes, we validate that the secret included in the request matches the one we specified when creating the webhook in Step 1. The secret is passed in the x-hub-signature header as an SHA1-hashed string, so we hash our secret and compare it to what GitHub sends us. If the request is authentic, we execute a shell command to update our local repository using git pull. Now that our script is in place, let's make sure that it is working properly. Press the three dots to the far right to reveal the Redeliver button. With the node server running, click Redeliver to send the request again. Once you confirm you want to send the request, you'll see a successful response. This is indicated by a 200 OK response code after redelivering the ping. We can now move on to making sure our script runs in the background and starts at boot. Use CTRL+C stops the node webhook server. systemd is the task manager Ubuntu uses to control services. We will set up a service that will allow us to start our webhook script at boot and use systemd commands to manage it like we would with any other service. Add the following configuration to the service file which tells systemd how to run the script. This tells Systemd where to find our node script and describes our service. Make sure to replace sammy with your username. 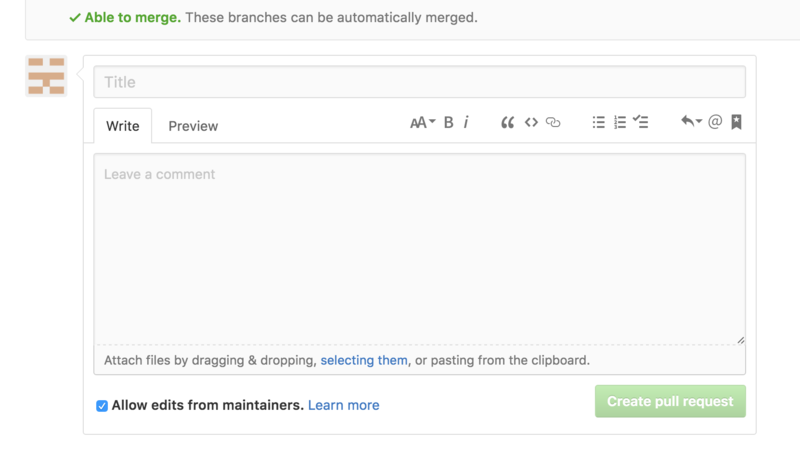 You are now able to push new commits to your repository and see the changes on your server. Make a change to one of the files in the repository. Then commit the file and push your code to GitHub. git commit -m "Update index file"
The webhook will fire and your changes will appear on your server. You have set up a Node.js script which will automatically deploy new commits to a remote repository. You can use this process to set up additional repositories that you'd like to monitor. You could even configure it to deploy a website or application to production when you push your repository.